It’s no surprise that cloud computing has literally taken the world by storm. For most businesses and enterprises, gone are the days of struggling with complicated on-premise server rooms and complicated networking. Over the past decade, cloud computing has become more cost-efficient, secure, and reliable. The major providers in the industry are now investing heavily in their hardware, software, and global networking infrastructure to obtain more market share, which has resulted in unparalleled performance. Healthy competition is always a win for consumers and partners as this drives costs down and requires them to constantly innovate to stay ahead. Typically when we think of cloud computing providers we are referring to the three giants in the industry: Azure, Google Cloud, and AWS. 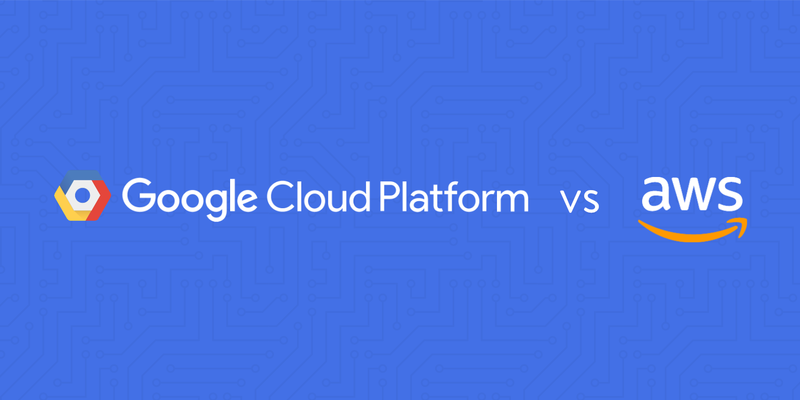 Today we’re going to compare just two of them, Google Cloud vs AWS. We exclusively utilize Google Cloud Platform here at Kinsta, but we’ll try to keep this article as unbiased as possible and explain everything in layman’s terms. There are definitely some advantages and disadvantages to both providers. Trust us, we’ve had our own share of challenges! No matter which provider you choose, you’ll always encounter issues at some point along the way. Before we dive into the comparison of Google Cloud vs AWS, let’s take a look at some of the latest cloud computing trends. It’s an exciting industry to be a part of. 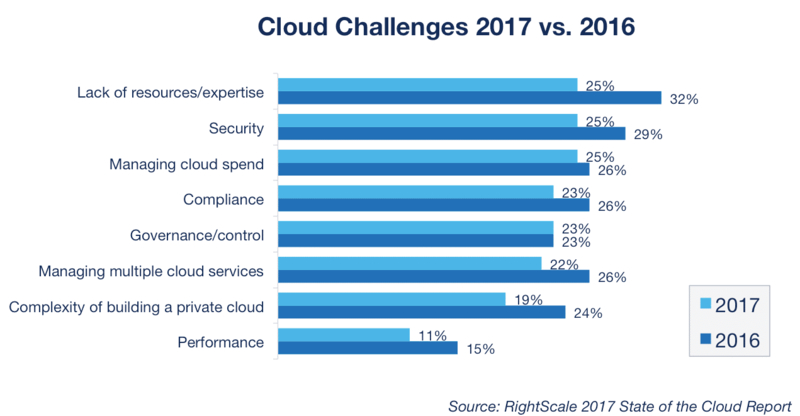 In January 2017, RightScale conducted its sixth annual State of the Cloud Survey in which they interviewed over 1,000 IT professionals to analyze current cloud computing trends. We can definitely see some interesting things happening. In 2016, 32% of participants responded saying that the number one cloud challenge was due to the lack of resources or expertise. In 2017, this number has dropped down to 25%. In 2016, 29% of participants responded saying that they were concerned with security as it pertains to cloud computing. In 2017, this number has dropped down to 25%. In 2016, 15% of participants responded said that performance was a challenge when it comes to cloud computing. In 2017, this number has dropped down to 11%. Performance and security have also made leaps and bounds over the past couple years simply due to the fact that cloud computing providers have had to invent new ways to host data more securely while delivering it faster. Most providers are now encrypting traffic between data centers by default. Another interesting aspect of their survey was to see the public cloud adoption statistics of 2017 vs 2016. AWS has stayed right around the same, while Azure and Google Cloud have both seen a fairly significant amount of growth. AWS definitely still is the leader, but this is mainly due to them being the first ones to really invest and shape the cloud computing industry. Google Cloud and Azure definitely have some catching up to do. According to predictions from Deloitte Technology, by the end of 2018, spending on IT-as-a-Service for data centers, software and services will be $547 billion. A BDO Technology Outlook Survey found that 74% of Tech Chief Financial Officers (CFOs) say cloud computing will have the most measurable impact on their business in 2017. IDC FutureScape predicts that by 2018, at least half of IT spending will be cloud-based, reaching 60% of all IT infrastructure, and 60–70% of all software, services, and technology spending by 2020. Wikibon is predicting that enterprise cloud spending is growing at a 16% compound annual growth (CAGR) run rate between 2016 and 2026. It’s also interesting to take a look at Google Trends to see the interest over time. There has definitely been a steady growth pattern over the past five years. Stack Overflow, one of the largest online communities for developers, also has a pretty nifty trends tool in which they analyze patterns based on the % of questions in a month. Developers make up for a big part of the industry. While a CTO might have the final say, it’s the developers, engineers, and sysadmins that are actually implementing the cloud computing solutions. 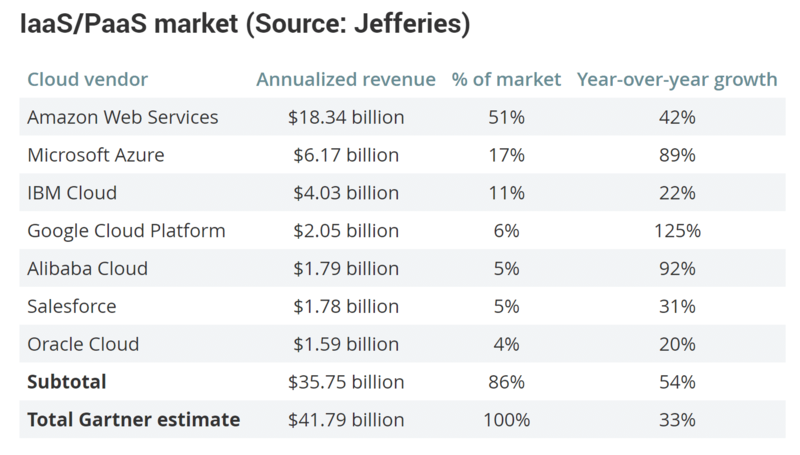 On December 20th, 2017 Jefferies analyst John DiFucci introduced quarterly snapshots of public cloud services. Even though Amazon rules the public cloud, the year-over-year growth of 125% by Google Cloud Platform in 2017 is pretty incredible! Alibaba and Microsoft Azure are also growing at a rapid pace. Google Cloud Platform is essentially made up of a lot of different services and solutions which allow you to utilize the same software and hardware infrastructure that Google uses for their own products, such as YouTube and Gmail. They launched their first service, Google App Engine in a public preview in 2008. In this article, we are going to be primarily looking at their Google Compute Engine and associated services, which allows users to launch virtual machines on demand. This is one of the primary services we use for clients here at Kinsta, along with LXD containers to allow for complete isolation and automatic scaling. Google Compute Engine was launched in a public preview back in June 2012, and it was then released for general availability in December 2013. Big brands now utilizing Google Compute Engine include Apple, HTC, Best Buy, Ubisoft, Philips, Domino’s Pizza, Leadpages, Heathrow, PayPal Coca-Cola, Evernote, Sony Music, and many more. Google Chief Executive Officer Sundar Pichai said Google Cloud Platform is a top-three priority for the company. The research firm Canalys estimates the business generated $870 million in the third quarter, up 76 percent year-over-year. To learn more, make sure to check out this in-depth annotated history of Google Cloud Platform put together by Reto Meier. 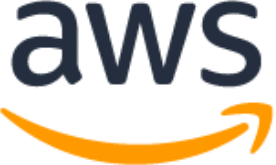 Amazon Web Services (AWS) is a subsidiary of Amazon.com which launched to provide cloud computing services to businesses and individuals back in 2006. Just like Google Cloud Platform, they have a multitude of different services and solutions. Amazon has definitely paved the way for cloud computing! We recommend checking out the TechCrunch article on how AWS came to be. In this article, we are going to be primarily looking at their Amazon EC2 and associated services, which essentially is the same thing as Google Compute Engine. Amazon EC2 was launched in a public beta back in August 2006. If you compare this against GCE, they have a six-year head start on Google. Big brands utilizing Amazon EC2 include Netflix, Time Inc., Nasa, Expedia, Airbnb, Lamborghini, and many more. Because Google Cloud and AWS are very similar, it’s easier to break down our comparison into different categories. We can’t cover everything in this post as each provider has well over 50 different products (AWS has over 200)! 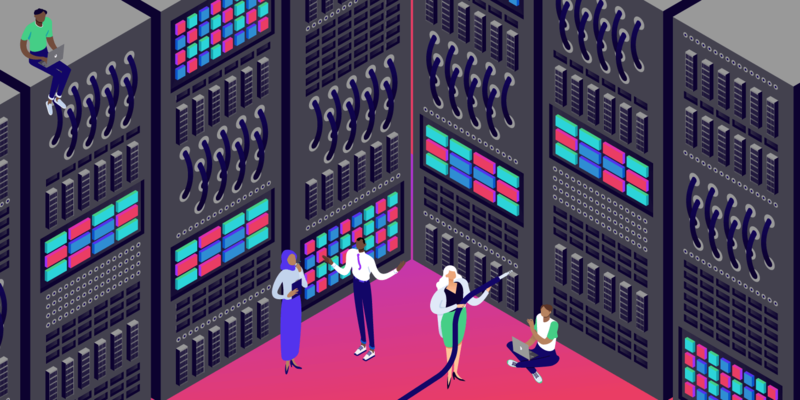 So we’ll cover products such as compute instances, billing, networking, storage, and features that we utilize here at Kinsta that directly relate to how we scale WordPress hosting for our clients. Feel free to click on a specific one below to jump right to it. The first category is how Google Compute Engine and AWS EC2 handle their virtual machines (instances). The technology behind Google Cloud’s VMs is KVM, whereas the technology behind AWS EC2 VMs is Xen. Both offer a variety of predefined instance configurations with specific amounts of virtual CPU, RAM, and network. However, they have a different naming convention, which can at first be confusing. Google Compute Engine refers to them as machine types, whereas Amazon EC2 refers to them as instance types. You can equip Google Compute Engine instances with up to 160 vCPUs and 3,844 GB of RAM (New machine types released July 18, 2018). Below is a comparison of VMs that fall into similar categories across providers, such as high memory, high CPU, SSD storage, etc. It should also be noted that Google Cloud allows you to depart from the predefined configurations as seen above and customize your instance’s CPU and RAM resources to fit your workload. These are known as custom machines. Other types include Google Cloud Preemptible VMs and AWS EC2 Spot Instances. The type of storage and disks used by a cloud provider play a very important part, as they have a direct impact on performance, such as expected throughput (IO), max IOPs per volume/instance, and the ability to burst capacity for short times. There are two primary types of storage options when you compare Google vs AWS: block storage and object storage. Block storage is essentially virtual disk volume used in conjunction with cloud-based virtual machines. Google Compute Engine offers persistent disks, whereas AWS EC2 offers this via their Elastic Block Store (EBS). 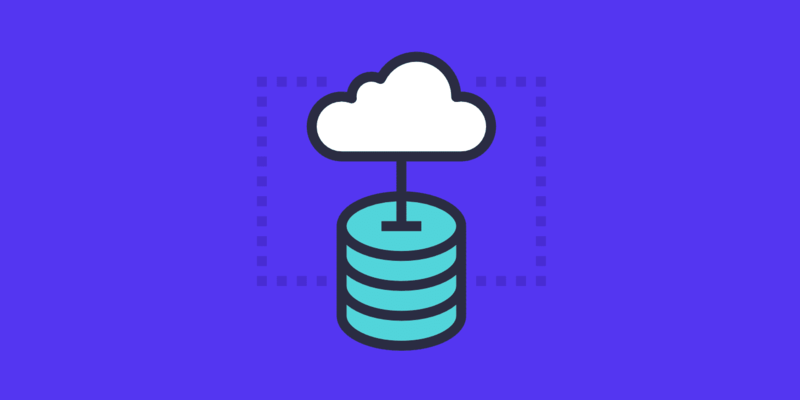 Object storage, also sometimes referred to as distributed object storage, are essentially hosted services for storing and accessing large numbers of binary objects, or blobs. Google Compute Engine offers this via their Google Cloud Storage service, whereas AWS offers this via their Amazon S3 service. In addition to standard networked block and object storage, Compute Engine and Amazon EC2 both allow users to use disks that are locally attached to the physical machine running the instance. Local storage offers superior performance, very high input/output operations per second (IOPS), and very low latency compared to persistent disks. This type of storage is even capable of achieving several GBs read/write speeds, which is huge! Google Cloud calls these local SSDs, whereas AWS EC2 refers to them as instance store volumes. Google allows you to attach local SSDs to any instance type whereas AWS only supports the following instance types: C3, F1, G2, HI1, I2, I3, M3, R3, and X1. In August 2017, Google Cloud also announced a price cut on their local SSDs for both on-demand and preemptable instances. Google Cloud and AWS both utilize different networks and partners to interconnect their data centers across the globe and deliver content via ISPs to end users. They offer a variety of different products to accomplish this. The achievable network capacity on Google Compute Engine instances works slightly differently as it is based on the quantity of CPUs your VMs have. Each core is subject to a 2 Gbits/second (Gbps) cap for peak performance. Each additional core increases the network cap, up to a theoretical maximum of 16 Gbps for each virtual machine. A big factor when it comes to comparing the two providers is network latency. Latency is important when it comes to businesses that serve visitors in a specific geographical location. For example, let’s say you have an e-commerce shop in Frankfurt, and 90% of your customers are from Germany. Your business is going to greatly benefit from placing your site on a server in Germany, vs hosting it in the United States or Asia. Just how much of a difference does it make? 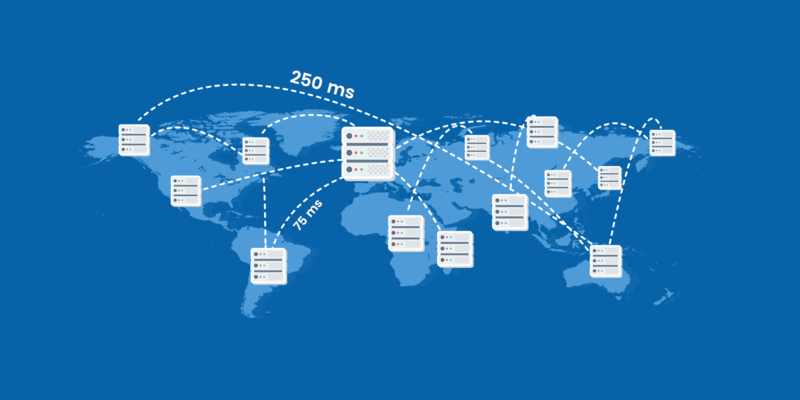 We put this to the test in our in-depth post on network latency and discovered that in some cases it can mean the difference of almost 2 seconds, depending on where you choose to host your site. This includes other factors as well, such as DNS, TTFB, etc. You’ll always encounter load time and latency, but thankfully Google Cloud and AWS have dozens of different locations to choose from around the globe. Choose wisely! There are few different tools out there which you can utilize to compare latency between providers. CloudHarmony is one of which provides objective, impartial and reliable performance analysis to compare cloud services. They utilize a network of about 50 servers located throughout the world to periodically measure and record latency and throughput measurements to other clouds. We ran a test of both Google Compute Engine and AWS EC2 from our current location in the US. Let’s first take a look at the network behind Google Cloud Platform. Google has been heavily investing in their global infrastructure, which includes new data centers. In fact, over half of their current locations where opened in 2017. We at Kinsta appreciate Google’s dedication to global expansion as this helps decrease latency across the board and ensure faster load times for our clients. 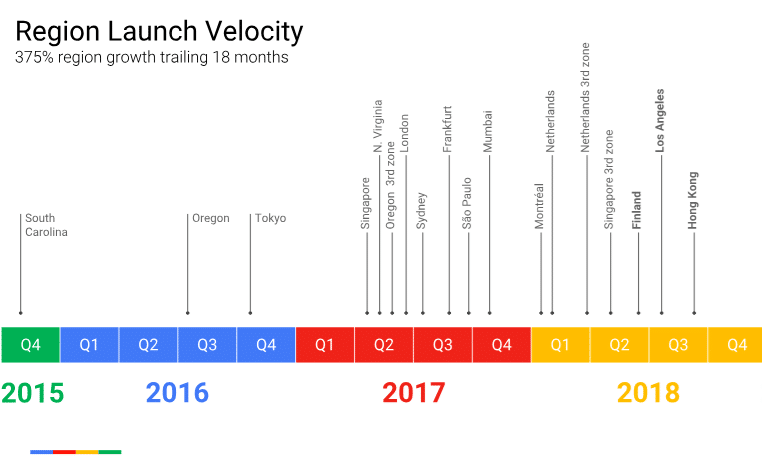 And Google Cloud is launching new regions rapidly. If you are a Kinsta client, these are all available for you to choose from when hosting your WordPress site. We also utilize Google Cloud Platform’s multi-regional deployment mode. This means that you aren’t restricted to a single data center for your account. 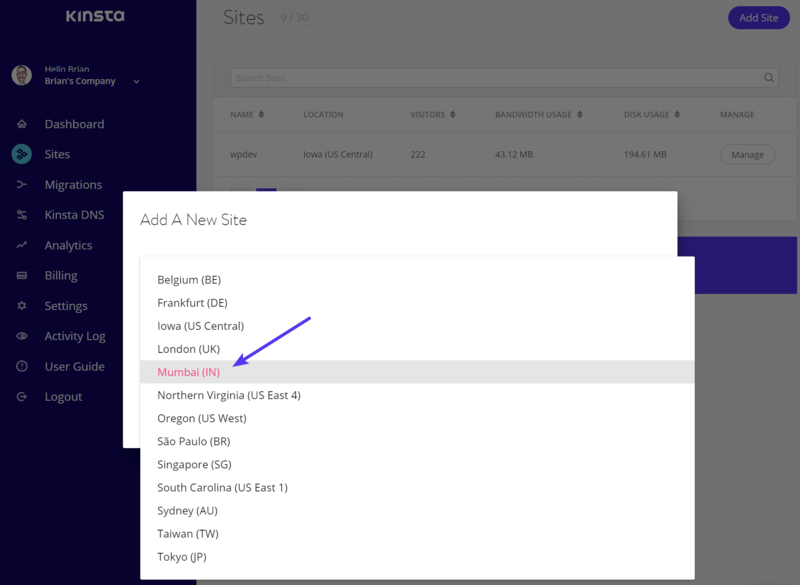 You can choose a different data center for each of your websites with a single click from within the MyKinsta dashboard (as seen below). On June 29, 2016, Google announced their investment in the FASTER Cable System which gives Google access to up to 10Tbps (Terabits per second) of the cable’s total 60Tbps bandwidth between the US and Japan. They are using this for Google Cloud and Google App customers. The 9,000km trans-Pacific cable is the highest-capacity undersea cable ever built and lands in Oregon in the United States and two landing points in Japan. Google is also one of six members which have sole access to a pair of 100Gb/s x 100 wavelengths optical transmission strands between Oregon and Japan. It is blazing fast. The other thing – it has a privately distributed backbone between all the data centers. You are talking over Google’s backbone, not over the Internet. 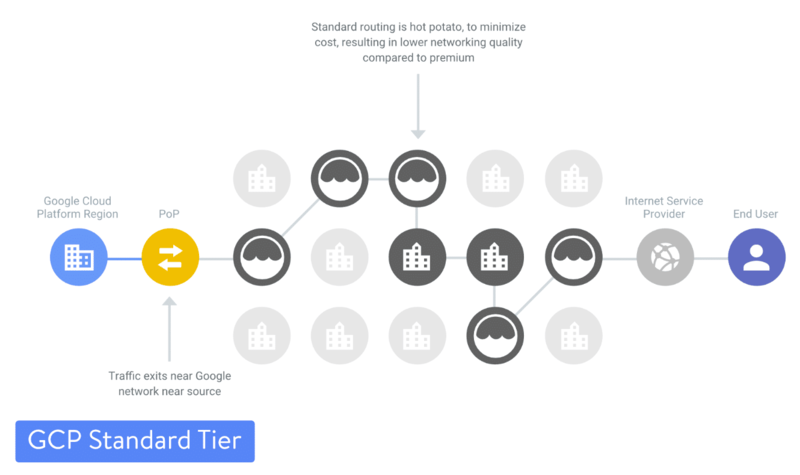 As of August 2017, Google Cloud Platform launched their separate premium tier and standard tier networks. This makes them the first major public cloud to offer a tiered cloud network. The premium tier delivers traffic over Google’s well-provisioned, low latency, highly reliable global network. Redundancy is key, and that’s why there are at least three independent paths (N+2 redundancy) between any two locations on the Google network, helping ensure that traffic continues to flow between the locations even in the event of a disruption. How much of a difference is there between the standard and premium tiers? Cedexis, a well-known objective performance, and monitoring company, published their findings. 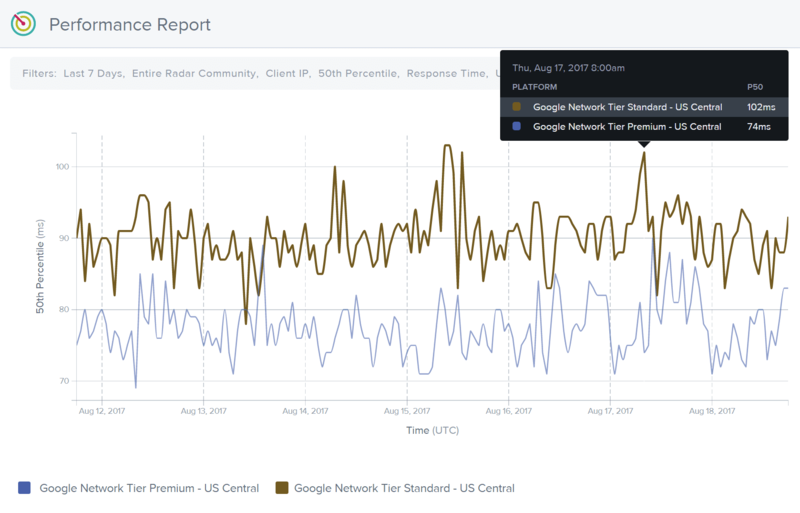 Here is a measurement from Cedexis Radar of the difference in latency on Google Cloud Platform’s premium tier vs the standard tier in the United States. 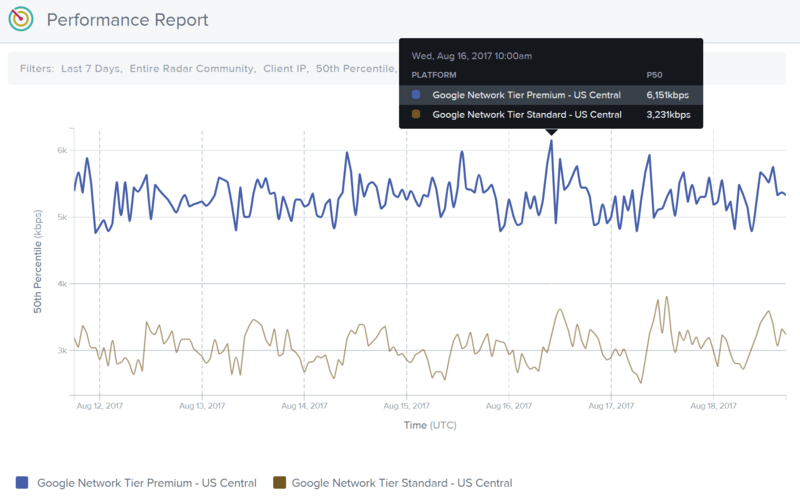 Here is a measurement from Cedexis Radar of the difference in throughput on Google Cloud Platform’s premium tier vs the standard tier in the United States. 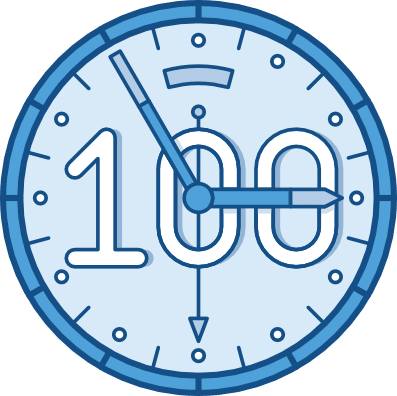 Kinsta utilizes Google Cloud Platform’s premium tier for all of our clients to ensure lightning-fast load times by minimizing traceroute hops and decreasing the distance the data has to travel. But it is also great to see a lower tier added for those on tighter budgets or for projects that don’t require as fast of speeds. They also offer their Virtual Private Cloud and additional ways to accelerate content delivery via Google Cloud CDN. Now let’s take a look at the global AWS network. The AWS Cloud operates 44 availability zones within 16 geographical regions around the world. 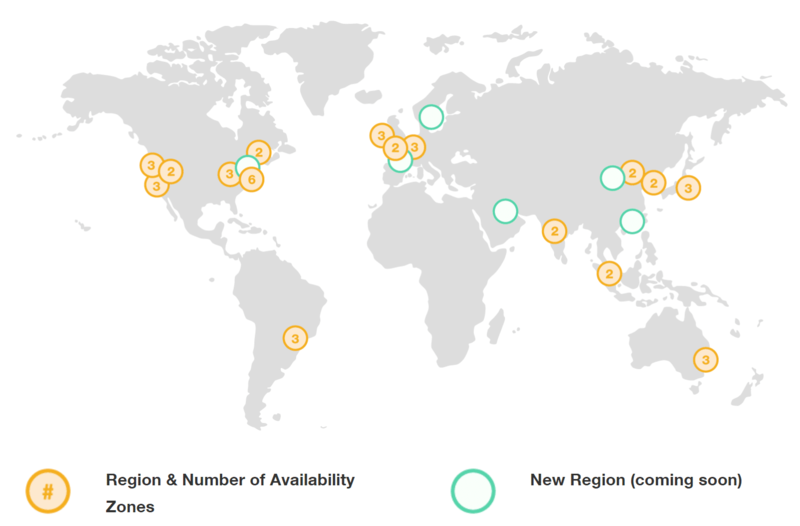 Just like Google, each AWS Region has multiple availability zones and data centers. This is great for redundancy, fault tolerance, and low latency. Just like with Google Cloud’s Dedicated Interconnect, Amazon also offers what they call AWS Direct Connect. AWS Direct Connect lets you establish a dedicated network connection between your network and one of the AWS Direct Connect locations. AWS offers carrier peering, but doesn’t offer direct peering or CDN peering. They also offer their Amazon Virtual Private Cloud (VPC) and additional ways to accelerate content delivery via Amazon CloudFront. Estimating monthly spend with both of these cloud providers can be a challenge. There are even entire tools out there such as reOptimize or Cloudability which were built to help you understand your bills better. Essentially AWS offers you a dashboard which provides insights into your bill. Google Cloud Platform provides estimated exports via their BigQuery tool. However, both providers are doing things to decrease costs and make billing easier. AWS announced their per second billing in September 2017 (one-minute minimum on EC2 instances). This allows for greater flexibility for clients who need to spin up new instances and do a lot of work in a short amount of time. Not to our surprise, Google Cloud Platform also launched their per second billing (one-minute minimum on Google Compute Engine instances). This goes to show you how competitive this market really is. AWS and GCP are almost launching new features simultaneously now. We even have a hard time keeping up! If, on average, your VM lifetime was being rounded up by 30 seconds with per-minute billing, then your savings from running 2,600 vCPUs each day would be enough to pay for your morning coffee (at 99 cents, assuming you can somehow find coffee for 99 cents). By comparison, the waste from per-hour billing would be enough to buy a coffee maker every morning (over $100 in this example). Google Cloud has what they all Committed Use Discounts, which is now available to all Compute Engine customers as of September 2017. This is basically the ability to purchase committed use contracts in return for deeply discounted prices for VM usage. When comparing Google’s 1–year Committed Use Discount to the AWS 1-year Standard RI, the total cost of the Google environment was 28 percent less than AWS. 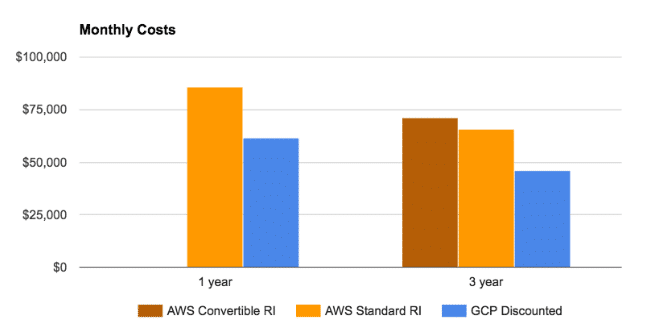 When comparing Google’s 3-year Committed Use Discount to the AWS 3-year Convertible RI, the total cost of the Google environment was 35 percent less than AWS. Another really huge cost-saving discount that Google Cloud offers is what they call Sustained Use Discounts. These are automatic discounts that Google Cloud Platform provide the longer you use the instance, unlike with AWS where you have to reserve the instance for a long period of time. Just starting out, or perhaps you ware wanting to compare the cloud providers for yourself? Not to worry as both of them have great free trials. Make sure to check out each provider’s websites for more details as both of them provide free trials across a lot of their products, not just their compute instances. 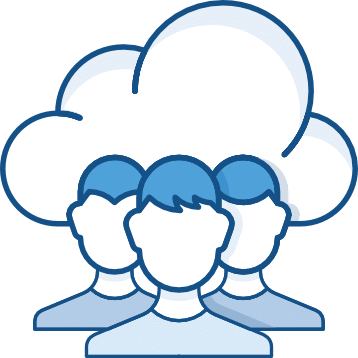 Both Google Cloud and AWS have extensive documentation and community forums which you can take advantage of for free. However, if you need assistance or support right away, you’ll have to pay. Both Google Cloud and AWS have support plans, but you’ll definitely want to read the fees involved as they can add up quite fast. Both providers include an unlimited number of account and billing support cases, with no long-term contracts. 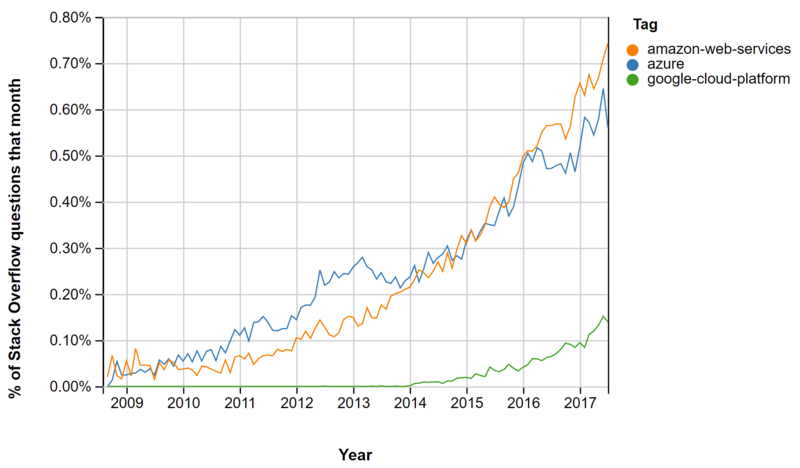 Both Google Compute Engine and AWS EC2 both have SLAs which provide a monthly uptime percentage of at least 99.95%. No provider is perfect, and we can definitely vouch for that here at Kinsta. If you are utilizing either of these providers you’ll definitely want to subscribe to their status pages to stay up to date on incidents as they occur. Like with many services, however, we have seen delays both from Google and Amazon on updating their status dashboards. One advantage to AWS when it comes to uptime is that you have the ability to get different machines within their multiple availability zones per region. With Google Cloud, it could very well be that your instances might be on the same machine per region. However, Google Cloud also has a unique feature with their ability to live migrate virtual machines. Benefits of live migrations allow for the engineers at Google to better address issues such as patching, repairing, and updating the software and hardware, without the need for you to worry about machine reboots. In their Second Annual Cloud Computing Survey (2017), Clutch surveyed 283 IT professionals at businesses across the United States that currently use a cloud computing service. In regards to security, they found that almost 70% of professionals were more comfortable storing data in the cloud than their previous legacy systems. 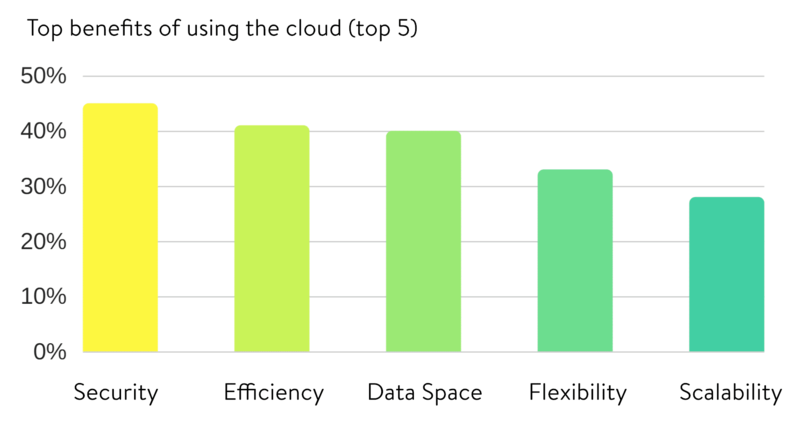 They also asked the respondents to list the top benefits of using the cloud and the largest percentage (45%) responded with security as being the top benefit. When looking at Google Cloud Platform’s security, it’s important to remember that this is one area where they have been improving long before GCP even launched. You get the benefit of a security model that has been built upon over the course of 15 years, and currently secures products and services like Gmail, Search, etc. Google currently employs more than 500 full-time security professionals. Niels Provos, a Security Engineer at Google, gave a great in-depth look at the security of Google Cloud Platform (see video below). All data is encrypted in transit between Google, the customers, and data centers by default; as well as the data in all of the Cloud Platform services. The data stored on persistent disks is encrypted under 256-bit AES and each encryption key is also encrypted with a set of regularly changed master keys. Google Cloud Identity and Access Management (Cloud IAM ) was launched in September 2017 to provide predefined roles that give granular access to specific Google Cloud Platform resources and prevent unwanted access to other resources. This is similiar to AWS IAM. You can see more in-depth behind the scenes in Google’s security whitepaper. Kinsta also uses Linux containers (LXC), and LXD to orchestrate them, on top of Google Cloud Platform which enables us to completely isolate not just each account, but each separate WordPress site. This is a much more secure method than offered by other competitors and helps ensure secure WordPress hosting 24×7. All data is encrypted in transit between AWS, the customers, and data centers; as well as the data in all of the AWS cloud. The data stored on EC2 instances is encrypted under 256-bit AES and each encryption key is also encrypted with a set of regularly changed master keys. Network firewalls built into Amazon VPC, and web application firewall capabilities in AWS WAF let you create private networks, and control access to your instances and applications. Flexible key management options, including AWS Key Management Service, allowing you to choose whether to have AWS manage the encryption keys or enable you to keep complete control over your keys. Dedicated, hardware-based cryptographic key storage using AWS CloudHSM, allowing you to satisfy compliance requirements. You can see more in-depth behind the scenes in Amazon’s security pillar whitepaper. So who is the winner when it comes to comparing Google Cloud vs AWS? Well, we would say that both providers have their pros and cons. We, of course, are partial to Google Cloud here at Kinsta and are excited to see the rapid rate of global expansion over the past year. 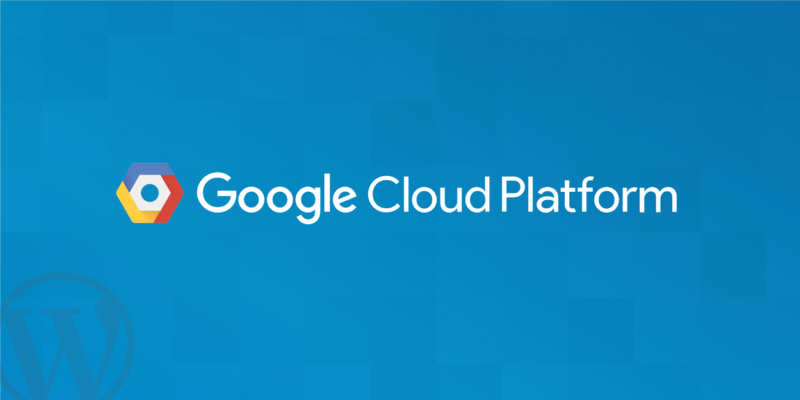 When it comes to pricing and speed, Google Cloud Platform is definitely one you want to check out! AWS of course also has a long-standing history of providing cloud computing services for business and enterprises over the past decade. They really were the first ones to push the cloud industry forward, and are still the one that providers like Google and Azure are copying. Their support, redundancy, and availability per region is superb. There are many other products and services from Google Cloud and AWS which we couldn’t cover in this post. But rest assured, the constant battle of cloud computing providers to gain more of the market share only benefits consumers and hosting partners such as Kinsta. It means lower prices, more products and services, and increased performance. Do you prefer one cloud computing provider over another? We would love to hear your thoughts below. Google Cloud is my favorite because of performance, pricing, global infrastructure using their own undersea fibers, simplicity of products, and superior global tools like load balancer ! AWS is great! I use it for web hosting, data storage and streaming analytics. AWS provides such a wide range of nimble and scalable services I can configure. Thanks Jimish! We’ll definitely be doing another comparison with Azure as well. Stay tuned. Agreed; in addition to adding Azure to the mix, bit more on security and vulnerability protection and defences against Cyber attacks will be nice, other than the encryption capabilities..
I’m trying to figure out which is the better choice for a consumer health data start-up. That Google is 35% cheaper over 3 years is pretty compelling! Tell me why I want to use AWS if it’s so much more pricey. Hey Lydia, even though we utilize Google Cloud Platform here at Kinsta we tried to be as unbiased as possible in the post above. Google definitely keeps lowering their prices! However, they both have free trials. So you might want to spin up machines on both and see which one you like better. Both have their pros and cons. Yes, that was an error. Thanks for letting us know. We have updated that above. Lots of very useful tips there. Especially about Elastic Block Store (EBS) and persistent disks, before reading this article i didn’t know much about EBS. Very useful. Thanks for sharing. It really saves my time. This was helpful. especially the cost comparison part. there was no easy one stop way of finding out who is cost effective in each of the services provided. Thank you so much! Hi, you updated the title from 2018 to 2019, can you update the charts info too? Hey Bruno! Yes, we are already working on a complete rewrite/update for this post. Hopefully should be updated soon.